The Stanley Cup is the most beautiful of sports trophies. It shimmers. It’s big. When ancient peoples returned from the hunt, they held their prize aloft. When players today win a championship, in a timeless gesture of triumph, they throw their hands above their heads. And in sports, nothing fits better between a player’s hands than the Stanley Cup. It is perfect. It didn’t begin that way. It started as a silver bowl like many others. But then someone who had no faith in hockey’s future, or who just didn’t think, decided that every player whose team won the Cup would have his name engraved on it. The Cup soon needed a base; then a bigger base. New rings of names had to be added, then more. Decades later someone else decided that not every name needed to be displayed all the time. Rings could be rotated in and out. The Cup could grow to its perfect dimension, then stop. What might have become chicken feathers became chicken soup. Then another decision was made many years later, and a tradition born. The NHL decided in 1995 that thereafter each player on a Stanley Cup-winning team, in the summer that followed its victory, would be able to spend a day with the Cup. The player could take the Cup, the symbol of his dreams as a kid, where he wanted and do what he wanted with it. In earlier years, a few superstar players had been given the privilege. Beginning with the New Jersey Devils, every player would get his chance. Most players take the Cup home. Home might be a big city, but within that city, home is a community, a neighborhood. Often, home is a small town. A player has a chance to think about those who matter most in his life, who’ve helped him most to get to where he is — his parents, his wife, his coaches, one coach, his friends, one friend — and for that day to share the Cup with them. To thank them. Cup-day stories are terrific. From Lac Beauport, Ithaca, and Winkler; Neudorf, Allen, Viking and Jesenice; Port McNeill, Kenora, Garden River, Grand Ledge, Sylvan Lake, Meadow Lake, Ventnor, Stamford, and Chelyabinsk — and those are only some of the towns where the Cup traveled, with some of the players of the 2012 champion Los Angeles Kings. For generations, no player from Newfoundland had ever played in the NHL. Then in 1962, Alex Faulkner, from Bishop’s Falls, joined the Detroit Red Wings. For many more years no one else followed him. Then on July 1, 2008 — Canada Day — Daniel Cleary, also of the Red Wings, returned to his hometown of Harbour Grace, population 3,000, the first Newfoundlander to win the Cup; 27,000 people were there. I was on six Stanley Cup-winning teams. I retired in 1979, so I never had my day with the Cup. Every year since 1995 I read those Cup-day stories. I imagined what I would do, where I would go, and with whom I would share the Cup. I never mentioned my fantasy to anyone else. I had two places in mind, for a morning and an afternoon; I never did figure out what I’d do at night. But that didn’t matter. I knew I would never get that chance. The Hockey Hall of Fame is the Cup’s custodian. A few years ago, I asked its president, Jeff Denomme, if he had ever considered allowing Cup-winners from prior to 1995 a day with the Cup — in the winter, of course, after the previous year’s champion had enjoyed its moment. He replied that he had thought about it, but he didn’t comment further. Fearing a “no” if I pushed harder, I left it at that. In August 2011, my brother, Dave, and I were talking about our childhood home in Etobicoke. Many years earlier, our parents had started a charity. Dave, our sister, Judy, and I had moved away, the charity began to grow, and room by room it had taken over the house. Today the name “Dryden” is still on a sign by the driveway, but no one lives there. In the backyard, where all those ball hockey games had been played, no games have been played in decades. Dave mentioned to me that the basement in the house kept flooding and the repair people thought the problem might be the backyard pavement. The charity, which Dave now runs after the death of our parents, decided the pavement needed to be removed. Dave thought he was just passing on news. Then I told him of my imagined day. He said they could put off work at least for several weeks. I went back to Denomme, this time with the push of urgency. Denomme said yes. I was put in touch with Phil Pritchard, who, on behalf of the Hall, is the Cup’s white-gloved curator. He told me that the Boston Bruins, as defending champions, controlled the Cup until their opening home game on October 6. That was a Thursday. I told him what I hoped to do: the morning and afternoon would be in Etobicoke (pronounced Eto-bi-co); the night, which I had finally worked out in my mind, would be more than a two-hour plane ride west. The daytime events would need to be on a Saturday, Pritchard said. The nighttime segment would have to be the evening prior. As the weekend following the Bruins’ opener was Canadian Thanksgiving, Pritchard suggested the Friday-Saturday a few days later for our Cup celebration. I had known two pieces of this fantasy since the moment I had imagined what a day like this might be. The first team I played on was Humber Valley. I was seven. I played for them every year after that, including Junior B with the Etobicoke Indians, an extension of the Humber Valley system, until I went to Cornell. Part of my Cup-day would be at Central Arena, once the area’s and our main rink. Humber Valley, which had two teams in its first year (1954), the year I began, now has 100 teams. Our event would be a celebration for those I had played with, and for those who have been on every Humber Valley team since. The second piece would be even more obvious. It would be in the backyard of our house, on that pavement, where most of my childhood games took place and my most vivid childhood memories were formed. It is there, as I’ve said, where hockey got inside me. We would play one final game, with all the original ball hockey players, their kids and grandkids. As for the day’s final piece: with the introduction and growth of the NHL’s Cup-day tradition, the trophy had reason to be in countless and far-flung places. Yet some towns in Canada, the United States, Sweden, Finland, Russia, wherever hockey is played, are too small ever to produce someone who would play in the NHL, let alone win a Stanley Cup. I thought about whether there was a place such as this where I might take the Cup that had been part of my life, which might stand for every other too-small town. Yes, I realized. Domain, Manitoba. Less than an hour’s drive south of Winnipeg, Domain is where my father was born. It’s where one of my cousins still operates the family farm. Dave and I flew from Toronto; Judy from Victoria. We got together at Shelley’s house in late afternoon with our Domain cousins, Shelley, Blair and Bill and their families, along with some of their friends, and with our Winnipeg cousins, Barb, Wendy, Deb, and Sonia, and their families — everyone but Pat, who had just gotten out of the hospital that week. Then we went to the rink. Hockey had been almost entirely an outdoor game until after the Second World War. Then, with money from the postwar boom, communities to be built and sacrifice to be commemorated, many hundreds of indoor “memorial” arenas were constructed across the country to honor those who had fought and died in the conflict. In 1967, many hundreds more “centennial” arenas went up to celebrate Canada’s 100th birthday. It was these indoor arenas that turned hockey from a sport played as much on boots as on skates into a truly national game. In rural areas, the construction of a rink also symbolized something more. In the postwar decades, new farm technology had allowed far fewer people to cultivate many more acres. Fewer towns were needed. Many wouldn’t survive. Those that did got the jump on neighboring towns by making themselves less dispensable. They won the right to establish a school or a clinic; they put up a grain elevator, or built a rink. In 1976, the people of Domain decided they needed an arena of their own. The money would come from a municipal debenture. The arena cost $60,000 and took the community sixteen years to pay off. Shaped like a Quonset hut, the Domain Arena is made of galvanized tin and has a sand floor. With no brine pipes beneath it to create the ice, its hockey season depends on the weather, usually beginning by mid-December and lasting until late March. Domain’s population is less than seventy; 650 were in the rink. It could fit no more. Many kids, and adults, wore jerseys of their favorite NHL teams. Dave wore his Sabres jersey; I wore my Canadiens; Judy, Team Canada. Many others wore the jerseys of their local teams — Domain Kernels, Domain Pitura Seed, Domain Generals, Macdonald Lightning, Oak Bluff Bulls, Sanford Sabres. They came from nearby villages and hamlets — LaSalle, Sanford, Brunkild, Oak Bluff, Starbuck, Osborne, Ste. Agathe, and Rosenort. Others came back home to be with their families, from Winnipeg and from places more distant. Three generations, even four, were there. The community had had less than a month to put this together. I had phoned Blair to tell him what I was hoping. When Jen Magarrell, chair of the rink board, got the call from Blair, she said (or thought), “Are you kidding me?! Can we do this? We have to! But how?” Getting off the phone, she then had to convince her husband and the rink board this wasn’t a joke. Shelley, the girl of the Dryden family between two brothers, small, bubbly, intense, always in motion — “We’re really going to have to cut down on her caffeine intake,” Blair said at one point in the evening — was another driving force. So many things had to be done. There were nine at their first community meeting, Shelley remembers, and, as she put it, “It just went from there.” A “rink crew” organized itself, removed old boards, and laid new concrete and gravel. There was a painting crew, a cleaning crew, a ground-cleaning crew, a parking crew, a security crew, a kids’ corner crew, a “Home Grown Talent” picture wall crew. There were electricians and carpenters, a silent auction group, a bar staff, and people who organized the photo line with the Cup. Local volunteer firefighters put up a tent as a beer garden. In all, about 100 volunteers helped out. There would need to be food. The women in the community talked long and hard about what to do. They decided they didn’t want to be stuck at home doing the hot dogs while their families were at the rink having fun — this was their celebration, too. So Danny’s Whole Hog from Stony Mountain, north of Winnipeg, provided chili, salads, and pork on a bun. Dave, Judy, and I walked into the rink carrying the Cup. Everyone stood and cheered. The Red River Quartet, a local Southern gospel group, sang “O Canada,” in barbershop style. Everyone stood again, stiff and proud, and belted it out with them. There were speeches, but not too many or too long. This night was about the Cup. Through dinner and the speeches, the kids ran around, the dust rose, and people lined up to have their picture taken with, to get close to, the Cup. So shiny, so bright, so impossibly there, they just wanted … to touch it. The adults knew that was too much. They couldn’t. This was The Cup. Again and again, they screeched at their kids, “No, no, no, you can’t touch it!” And again and again, Mike Bolt, the Hockey Hall of Fame’s Cup custodian for the weekend, said to them, “It’s OK.” And with big shiny smiles, the kids did; and with big shiny smiles and sometimes tears, the adults did, too. In their scramble to put this on, the people of Domain didn’t forget the little touches. The Domain Rink is too small to have a Zamboni. Instead, it has this odd contraption about four feet tall, four feet wide, and five feet long — it’s a fuel tank that holds eighty gallons of water held up by a fiberglass box on top of a steel frame, all juryrigged together — that floods the ice after the others on rink duty, with wide blade-like shovels, have scraped away the snow. It has no engine; it has to be pushed around by hand. Rather than seem to have the only arena in the world without a Zamboni, the people in Domain decided to have the only arena in the world to have a “Manboni.” That’s what they call it. And that night, on a makeshift stage, the Manboni served as the podium. The “Home Grown Talent” picture wall crew had laid out, among other photos, some of Dave, Judy, and me, our mom and dad, and our Domain grandparents, William and Amy Dryden. One particular photo included our mom, wearing a suit that had been made by Grandma Dryden, in Domain. Judy noticed it. Our cousins couldn’t have known, nor could the picture wall crew. Sometimes when you do everything else right, the unintended consequences work in your favor. When people not from Domain describe the village as being “in the middle of nowhere,” Domainers seem a little offended, and more surprised, as if that never occurred to them. As if they are somewhere. The night was about the Cup, but, as it turned out, more than that it was about the spirit that wins the Cup. It was about Domain. The next morning, Dave, Judy and I were on a 5:15 flight to Toronto. Guinner, not fast, not big, bad shot, couldn’t do anything but score. Later, we played together at Cornell where, as defending NCAA champions, we played the University of Toronto, defending Canadian champions. Going into overtime, 0-0, North American and Toronto bragging rights at stake, Guinner scored the winning goal. He is the funniest guy on every team he has played on. Tommy, Delkie, Bob and Ronnie were also there, and one who wasn’t, Big John, our captain and best player, who was still on the “DL” after a recent operation. John was 5-feet, 9-inches when, at eleven, the rest of us were a foot shorter. Despite all the goals he scored, his teammates still prefer to remember about him that night in Kingston in what is now referred to as “the most one-sided fight in hockey history.” Worse than suffering a black eye or broken nose, John had the Indian insignia ripped off his jersey. Still 5-feet, 9-inches, but frozen in time, he’s still Big John. Oafie wore his original Indians jacket; Neil, the bright red blazer the team had given us to look less teenager-like on the road. As with most of us, Oafie and Neil are now 50 percent bigger than their teenage selves, and their jackets were snug. But to players who still wanted to feel like a team, the snugger the funnier; the funnier the better. They were the teammates and stars of my childhood, no less memorable and important than Lafleur, Gainey, and Shutt. None of our Humber Valley or Etobicoke teams ever won a championship. But that day, forty-six years after we had last played together, we presented ourselves the Cup. About a mile away, at our family home, we had photos of old backyard moments blown up and displayed on the front lawn. A giant-screen TV showed full games — commercials and intermissions included — of the 1950s. There was Dubble Bubble in big glass jars, and Kool-Aid in a big Kool-Aid pitcher. A clown painted kids’ faces with logos of their favorite NHL teams. And in the side yard was the Cup. People lined up for individual photos, photos with old friends, with old best friends, with wives, with kids and grandkids to make old stories that had begun not to seem real, even to us, seem real again. In the backyard, there were two goalie nets. In the “small end,” one of the originals my father had made; the other had gone missing (it has since been found). In the “big end” was a net from the last game at the Montreal Forum. NHL games of the 1950s didn’t have music, but those today do. A few days before, I had asked Jimmy Holmstrom, the organist at Leafs games, if he knew anyone with a keyboard who could play for us. He said, “How about me?” So Jimmy played as we played. And before we did, because every NHL game, even those of the mind, has to begin with the national anthem, Michael Burgess, long-time Leafs anthem singer, sang “O Canada” — in English and French. Then the games began. Pritch, who had lived in the house behind us, was there. Brian with his son, Patrick; Stuie, Kevin, Jake, Dave, and Robbie. Al, Goose, and Guinner from the Humber Valley and Etobicoke teams were also there. Rope, who lived across the street and who, whenever he got hit in the “balls” with a shot would yelp and run around the house, this time managed to escape the same fate. Jon and Danny played the way they always had, still elegant (Jon), exuberant (Danny), and competitive (both). Dave’s daughter, Debbie, her husband, Sieg, and their kids, Theo and Anaka, were there. Dave’s son, Greg, and his wife, Patti, live in Peru. They couldn’t attend, nor could three of their kids, Chris, Kevin, and Jennifer, but Jeff, the eldest, flew overnight from Lima and made it. Our two children, Sarah and Michael, their spouses, Scott and Tammy, and their kids, Khaya and Mara, Hunter and Blake, were also all part of the action — eating, running around, playing with sticks too long with blades that curved the wrong way, climbing on the Cup. All of them new to this, none of them had earned backyard names. I had imagined we’d play “kids games,” “originals games,” “family-versus-family” multi-generational games. But everybody, especially the younger ones, just wanted to play. And that’s what we did. Many against many, a dirty old tennis ball bouncing off and over our ratty old sticks as we whacked at it. The kids didn’t have the stick skills of the adults; but with so little space the adults weren’t able to use them. The adults didn’t have the ability to move like the kids; but the kids had no room to move. The kids were as good as the adults —to their amazement; the adults were as good as the kids — to their amazement. It’s the miracle of ball hockey. Those seven and seventy felt equal, felt connected, felt better than they thought they were. It was just fun. Then, fifty-seven years after our first backyard game, the last game was over. 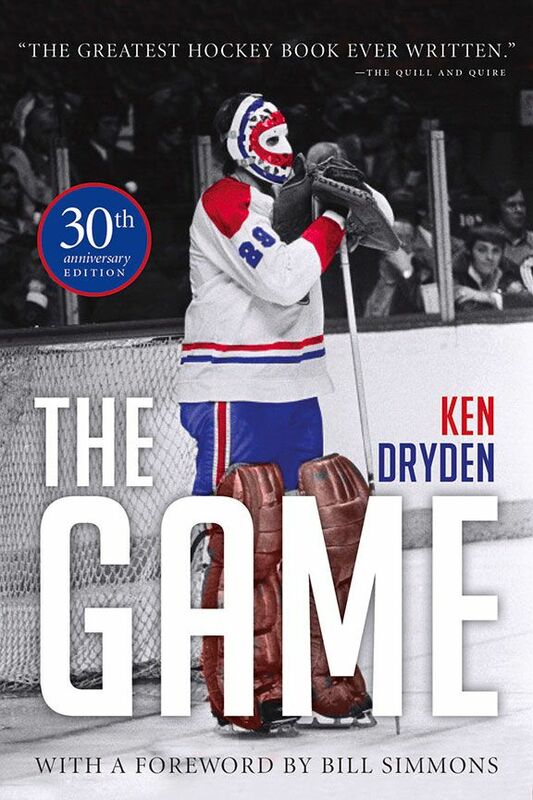 The Game: 30th Anniversary Edition is published in the U.S. by Triumph Books. In Canada, where it is published by HarperCollins, the book goes on sale Tuesday.